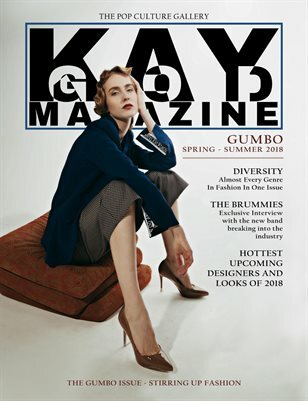 Kaygod Magazine's Spring Summer 2018 Print Issue, Gumbo, is a bird's eye view of today's fashion trends, from a youthful and exotic perspective. This issue has been heavily curated to pinpoint several different genres within the modern fashion industry from Chic, Street, Alternative, Retro, Elegant, Formal, Conceptual, and many more. We have curated this issue from contributors from several different countries and cities including Canada, Thailand, Russia, The United States, London, India, and many more. We focused more on fashion than music for this specific issue to truly capture the importance of global style and youth. This issue features exclusive interviews, interesting concepts, beautiful editorials, and stylish aditorials from upcoming designers. Kaygod Magazine is truly here to inspire your closet and inspiration for Spring Summer 2018.